The United States, as well all know, is the world’s most dominant economic and the land of opportunity. Many foreign companies and individuals take this opportunity to have access to its roaring economy. Every day, the number of foreign-owned businesses in the country increases, from big enterprises to small ones. These foreign companies, just like any domestic companies in the country, are subject to comply with all applicable US tax laws. Among many relevant requirements they need to fulfill with the Internal Revenue System or IRS is the Form 5472 – Information Return of Foreign-Owned US Corporation or Foreign Corporation Engaged in a US Trade or Business. The IRS Form 5472 or the Information Return of Foreign-Owned US Corporation or Foreign Corporation Engaged in a US Trade or Business, is an annual statement required by the IRS to companies that is at least 25% foreign owned, wherein the company has at least one direct or indirect 25% foreign shareholder at any time during the tax year or the company has a foreign shareholder that directly or indirectly owns at least 25% of the total voting power of all classes of stock entitled to vote and/or total value of all classes of stock of the corporation. In short, if a corporation that is engaged in doing business or trade in the US market is at least 25% foreign-owned, then it must submit a Form 5472 to IRS annually if it had a reportable transaction during the previous tax year with a foreign or domestic related party. 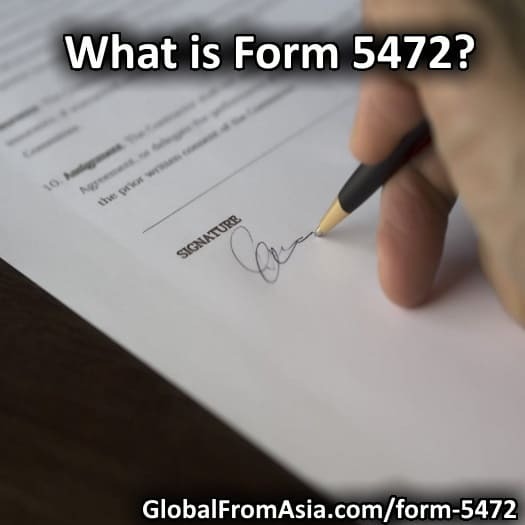 What are the Purposes of Form 5472? To disclose information required under sections 6038A and 6038C about reportable transactions during the tax year of a corporation that is at least 25% foreign-owned. To disclose involvement of foreign nationals to US businesses with IRS, the Department of the Treasury and other government bodies under tax treaties. To stop foreign tax evasion. Many foreign investors take advantage of the country’s LLC law to buy assets in the US without entering the country’s tax system thus enabling them to hide their assets from their local tax authorities. To avoid money-laundering. The lack of disclosure of foreign ownerships has led many foreign individuals to hide illegally obtained wealth by means of investing in legitimate US businesses. Form 5472 requires foreign owners of U.S. disregarded entities to avoid such crime. US Employer Identification number or EIN – if you don’t have an EIN yet, you may apply for it either online, via telephone, fax or mail. Information about the Reporting Corporation including name, registered address, business activity and corresponding principal business activity code, total assets, and country of incorporation. Information about the 25% Foreign Shareholder including name, foreign taxpayer identification number, citizenship, US identification number or reference identification number. Once the form 5472 has been duly completed, it shall be submitted to IRS along with the reporting corporation’s income tax return by the due date of the return. If the reporting corporation has more than 1 foreign related party, a separate form 5472 must be filed for each party. Lastly, as required by section 6001, a reporting corporation must keep and maintain its permanent books of account and adequate records to determine the correct treatment of transactions with related parties. Reporting corporation such as Foreign-owned LLC, foreign-owned US corporations, US partnerships with non-US partners, are required to file Form 5472 – only if it had a re-portable transaction during the previous tax year with a foreign or domestic related party. Should you fail to file form 5472 on time and in the manner prescribed or fail to maintain required books and records, a $10,000 penalty may be imposed. On the other hand, if you’ve submitted your form 5472 on time, but not able to supply all the required information, you may also be liable to a fine. In addition, filing false or fraudulent information constitutes criminal penalties as well. Filing form 5472 can be excruciating – it’s complex and very critical. The penalties for not filing is severe, so it’s best to always ask your tax advisor to review your form 5472 before submitting it to the IRS to avoid mistakes and serious penalties.